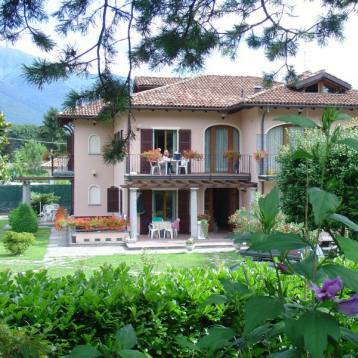 Our residence ”Villa Margherita” is located at a sunny and quiet location at the famous Lago Maggiore. Directly at the see and very close to the city centre of Cannobio. We offer you generous brightened holiday flats and rooms for every komfort. well fitted citchen, washing machine, showers/toilets, furnished balkony or veranda, TV, phone, car park. A beautiful lawn for sunbathing with typical plants of this region and our snackbar are available for you. To complement you stay, we daily offer you a comprehensive breakfast. The residence ”Villa Margherita” has 4 comprehensive and comfortable rooms. Every room has it`s own shower/toilet, balkony or veranda, big fridge, komplette Wäsche (?? ), TV, phone. In our snackbar we daily serve you with an extensive breakfast.